A right outer join will give all rows in B, plus any common rows in A. The Venn diagrams don't really do it for me. They don't show any distinction between a cross join and an inner join, for example, or more generally show any distinction between different types of join predicate or provide a framework for reasoning about how they will operate. There is no substitute for understanding the logical processing and it is relatively straightforward to grasp anyway. (For outer joins only) add back in any outer rows that were lost in step 2. I'll start off with an animated version of a full outer join. Further explanation follows. First start with a CROSS JOIN (AKA Cartesian Product). This does not have an ON clause and simply returns every combination of rows from the two tables. Inner and Outer joins have an "ON" clause predicate. Inner Join. Evaluate the condition in the "ON" clause for all rows in the cross join result. If true return the joined row. Otherwise discard it. Left Outer Join. Same as inner join then for any rows in the left table that did not match anything output these with NULL values for the right table columns. Right Outer Join. Same as inner join then for any rows in the right table that did not match anything output these with NULL values for the left table columns. Full Outer Join. Same as inner join then preserve left non matched rows as in left outer join and right non matching rows as per right outer join. The above is the classic equi join. The inner join condition need not necessarily be an equality condition and it need not reference columns from both (or even either) of the tables. Evaluating A.Colour NOT IN ('Green','Blue') on each row of the cross join returns. The join condition evaluates to true for all rows in the cross join result so this is just the same as a cross join. I won't repeat the picture of the 16 rows again. Outer Joins are logically evaluated in the same way as inner joins except that if a row from the left table (for a left join) does not join with any rows from the right hand table at all it is preserved in the result with NULL values for the right hand columns. This simply restricts the previous result to only return the rows where B.Colour IS NULL. In this particular case these will be the rows that were preserved as they had no match in the right hand table and the query returns the single red row not matched in table B. This is known as an anti semi join. 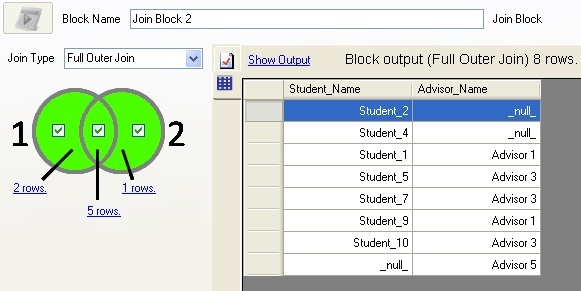 It is important to select a column for the IS NULL test that is either not nullable or for which the join condition ensures that any NULL values will be excluded in order for this pattern to work correctly and avoid just bringing back rows which happen to have a NULL value for that column in addition to the un matched rows. Right outer joins act similarly to left outer joins except they preserve non matching rows from the right table and null extend the left hand columns. Full outer joins combine the behaviour of left and right joins and preserve the non matching rows from both the left and the right tables. No rows in the cross join match the 1=0 predicate. All rows from both sides are preserved using normal outer join rules with NULL in the columns from the table on the other side. 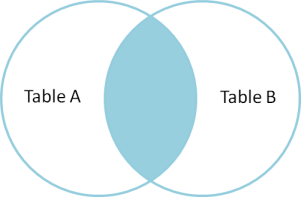 With a minor amend to the preceding query one could simulate a UNION ALL of the two tables. ... And then the "Where" clause runs. NULL= 'Green' does not evaluate to true so the row preserved by the outer join ends up discarded (along with the blue one) effectively converting the join back to an inner one. See these examples run live at SQLFiddle.com. 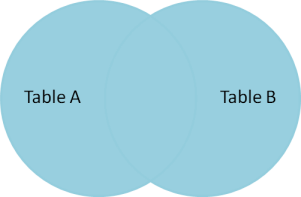 Outer Join:- An outer join does not require each record in the two joined tables to have a matching record. The joined table retains each record—even if no other matching record exists. Outer joins subdivide further into left outer joins and right outer joins, depending on which table's rows are retained (left or right). Full Outer Joins:- Full Outer Join or Full Join is to retain the nonmatching information by including nonmatching rows in the results of a join, use a full outer join. It includes all rows from both tables, regardless of whether or not the other table has a matching value. Retrieve the matched rows only, that is, A intersect B. Select all records from the first table, and any records in the second table that match the joined keys. Select all records from the second table, and any records in the first table that match the joined keys. An inner join retrieve the matched rows only. A inner join only shows rows if there is a matching record on the other (right) side of the join. A (left) outer join shows rows for each record on the left hand side, even if there are no matching rows on the other (right) side of the join. If there is no matching row, the columns for the other (right) side would show NULLs. Inner joins require that a record with a related ID exist in the joined table. Outer joins will return records for the left side even if nothing exists for the right side. For instance, you have an Orders and an OrderDetails table. They are related by an "OrderID". will only return Orders that also have something in the OrderDetails table. then it will return records from the Orders table even if they have no OrderDetails records. You can use this to find Orders that do not have any OrderDetails indicating a possible orphaned order by adding a where clause like WHERE OrderDetails.OrderID IS NULL. Inner join -> Take ONLY common records from parent and child tables WHERE primary key of Parent table matches Foreign key in Child table. Right join : Exactly opposite of left join . Put name of table in LEFT JOIN at right side in Right join , you get same output as LEFT JOIN. Outer join : Show all records in Both tables No matter what. 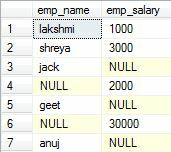 If records in Left table are not matching to right table based on Primary , Forieign key , use NULL value as result of join . 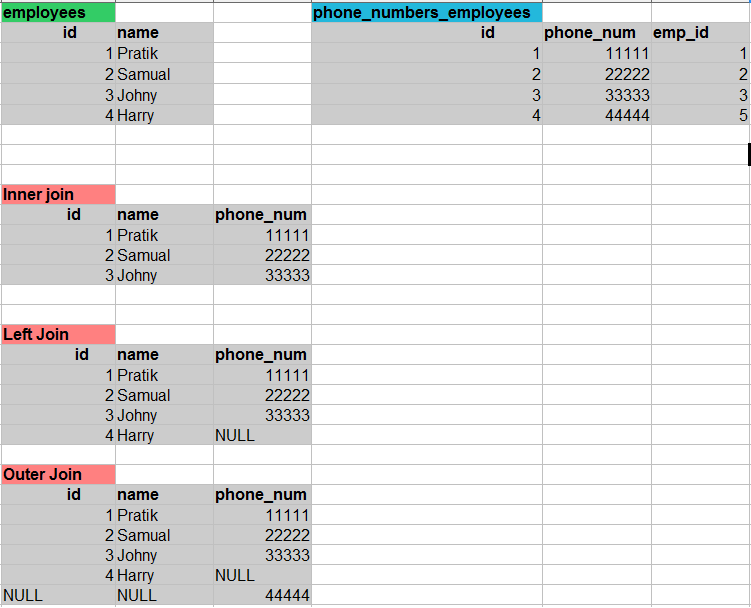 Take the records of 2 tables ONLY IF Primary key of employees table(its id) matches Foreign key of Child table phone_numbers_employees(emp_id). Here take only matching rows on primary key = foreign key as explained above.Here non matching rows on primary key = foreign key are skipped as result of join. 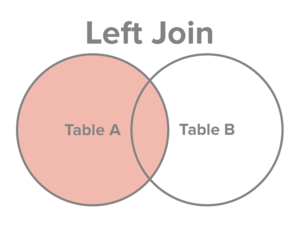 Left join retains all rows of the left table, regardless of whether there is a row that matches on the right table. You use INNER JOIN to return all rows from both tables where there is a match. i.e. In the resulting table all the rows and columns will have values. In OUTER JOIN the resulting table may have empty columns. Outer join may be either LEFT or RIGHT. LEFT OUTER JOIN returns all the rows from the first table, even if there are no matches in the second table. RIGHT OUTER JOIN returns all the rows from the second table, even if there are no matches in the first table. 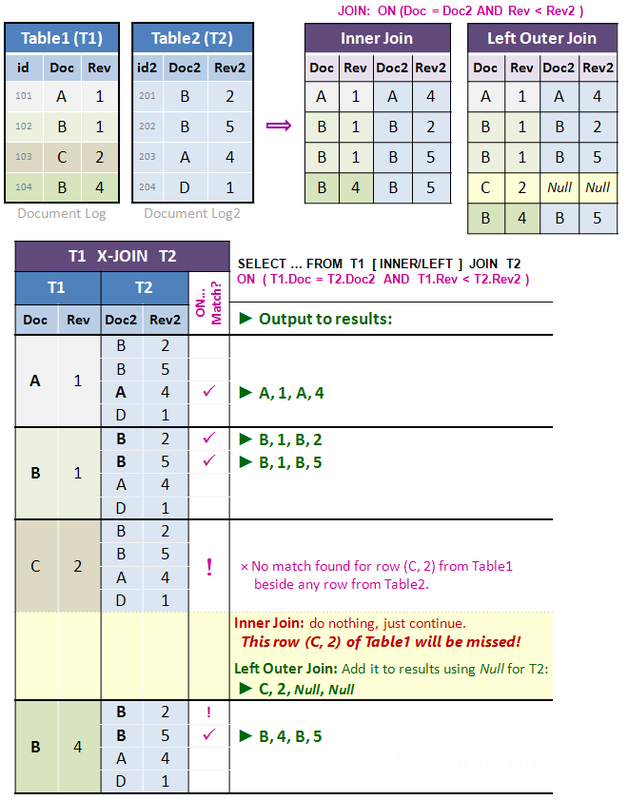 INNER JOIN requires there is at least a match in comparing the two tables. For example, table A and table B which implies A ٨ B (A intersection B). LEFT OUTER JOIN and LEFT JOIN are the same. It gives all the records matching in both tables and all possibilities of the left table. Similarly, RIGHT OUTER JOIN and RIGHT JOIN are the same. It gives all the records matching in both tables and all possibilities of the right table. 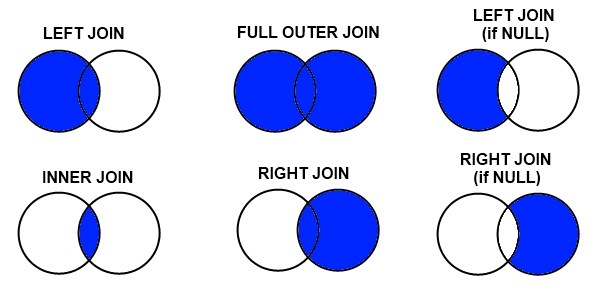 FULL JOIN is the combination of LEFT OUTER JOIN and RIGHT OUTER JOIN without duplication. The answer is in the meaning of each one, so in the results. In SQLite there is no RIGHT OUTER JOIN or FULL OUTER JOIN. And also in MySQL there is no FULL OUTER JOIN. My answer is based on above Note. Well, as your need you choose each one that covers your need ;). A join is combining the rows from two tables. An inner join attempts to match up the two tables based on the criteria you specify in the query, and only returns the rows that match. 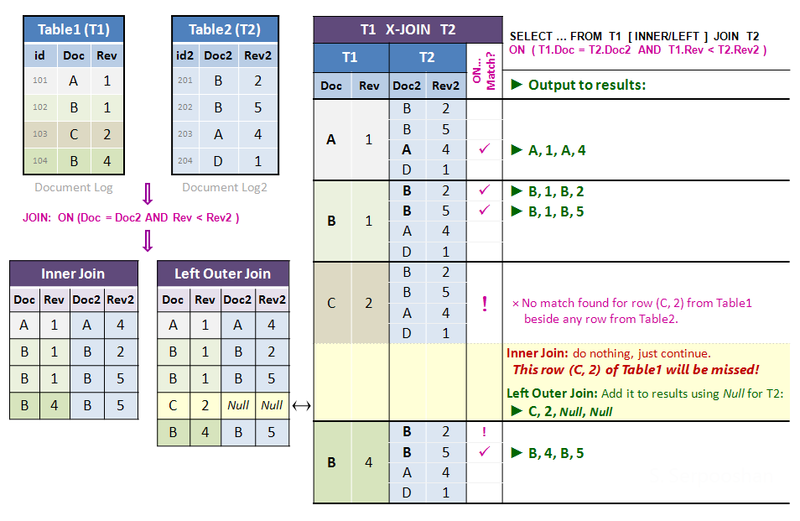 If a row from the first table in the join matches two rows in the second table, then two rows will be returned in the results. If there’s a row in the first table that doesn’t match a row in the second, it’s not returned; likewise, if there’s a row in the second table that doesn’t match a row in the first, it’s not returned. A left join attempts to find match up the rows from the first table to rows in the second table. If it can’t find a match, it will return the columns from the first table and leave the columns from the second table blank (null). I don't see much details about performance and optimizer in the other answers. Sometimes it is good to know that only INNER JOIN is associative which means the optimizer has the most option to play with it. It can reorder the join order to make it faster keeping the same result. The optimizer can use the most join modes. Are left outer joins associative? Does the join order matter in SQL? Evaluate the ON ... clause against each pair: ON( a, b[i] ) = true/false? When the condition evaluates to true, return that combined row (a, b[i]). When reach end of second table without any match, and this is an Outer Join then return a (virtual) pair using Null for all columns of other table: (a, Null) for LEFT outer join or (Null, b) for RIGHT outer join. This is to ensure all rows of first table exists in final results. Note: Left Join = Left Outer Join, Right Join = Right Outer Join. Having criticized the much-loved red-shaded Venn diagram, I thought it only fair to post my own attempt. Although @Martin Smith's answer is the best of this bunch by a long way, his only shows the key column from each table, whereas I think ideally non-key columns should also be shown. Inner Join: Returns matched records from both tables. Full Outer Join: Returns matched and unmatched records from both tables with null for unmatched records from Both Tables. Left Outer Join: Returns matched and unmatched records only from table on Left Side. Right Outer Join: Returns matched and unmatched records only from table on Right Side. 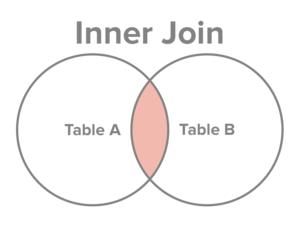 INNER JOIN most typical join for two or more tables. It returns data match on both table ON primarykey and forignkey relation. OUTER JOIN is same as INNER JOIN, but it also include NULL data on ResultSet. LEFT JOIN = INNER JOIN + Unmatched data of left table with Null match on right table. RIGHT JOIN = INNER JOIN + Unmatched data of right table with Null match on left table. 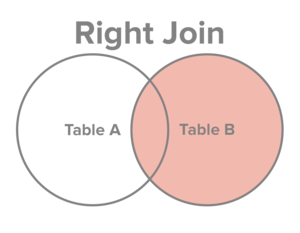 FULL JOIN = INNER JOIN + Unmatched data on both right and left tables with Null matches. Self join is not a keyword in SQL, when a table references data in itself knows as self join. Using INNER JOIN and OUTER JOIN we can write self join queries. They are the most commonly used existential operators in SQL, where INNER JOIN is used for 'exists' and LEFT OUTER JOIN is used for 'does not exist'. Some will think in terms of 'existance' within sets e.g. The only projection is from Users but we still need all those range variables (p, v, b) for search conditions. The UserId IS NULL search condition 'belongs' to the the OUTER JOIN but is disconnected in the query. LEFT is the industry standard: professionals will rewrite a query to avoid using RIGHT! The OUTER keyword from LEFT OUTER JOIN is omitted. Sometimes joins are used in queries solely to determine whether values exist or do not exists in another set. Learn to look carefully at the attributes being projected (the columns in the SELECT clause): if there are none from the joined table then they are simply being used as existential operators. Additionally for outer join, look for instances of <key_column> IS NULL in the WHERE clause. 1.INNER JOIN OR EQUI JOIN : Returns the resultset that matches only the condition in both the tables. 2.OUTER JOIN : Returns the resultset of all the values from both the tables even if there is condition match or not. 3.LEFT JOIN : Returns the resultset of all the values from left table and only rows that match the condition in right table. 4.RIGHT JOIN : Returns the resultset of all the values from right table and only rows that match the condition in left table. 5.FULL JOIN : Full Join and Full outer Join are same. 1.Inner Join: Also called as Join. It returns the rows present in both the Left table, and right table only if there is a match. Otherwise, it returns zero records. 2.Full Outer Join: Also called as Full Join. It returns all the rows present in both the Left table, and right table. 3.Left Outer join: Or simply called as Left Join. It returns all the rows present in the Left table and matching rows from the right table (if any). 4.Right Outer Join: Also called as Right Join. It returns matching rows from the left table (if any), and all the rows present in the Right table. 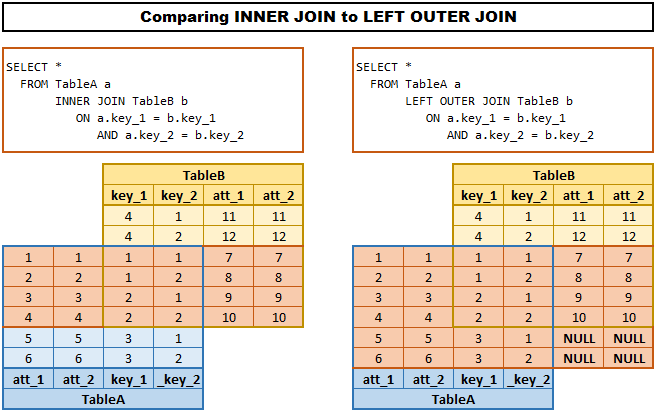 Inner join - An inner join using either of the equivalent queries gives the intersection of the two tables, i.e. the two rows they have in common. Left outer join - A left outer join will give all rows in A, plus any common rows in B. 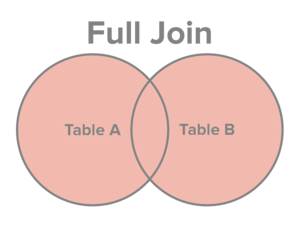 Inner join is a join that combined tables based on matching tuples, whereas outer join is a join that combined table based on both matched and unmatched tuple. Inner join merges matched row from two table in where unmatched row are omitted, whereas outer join merges rows from two tables and unmatched rows fill with null value. 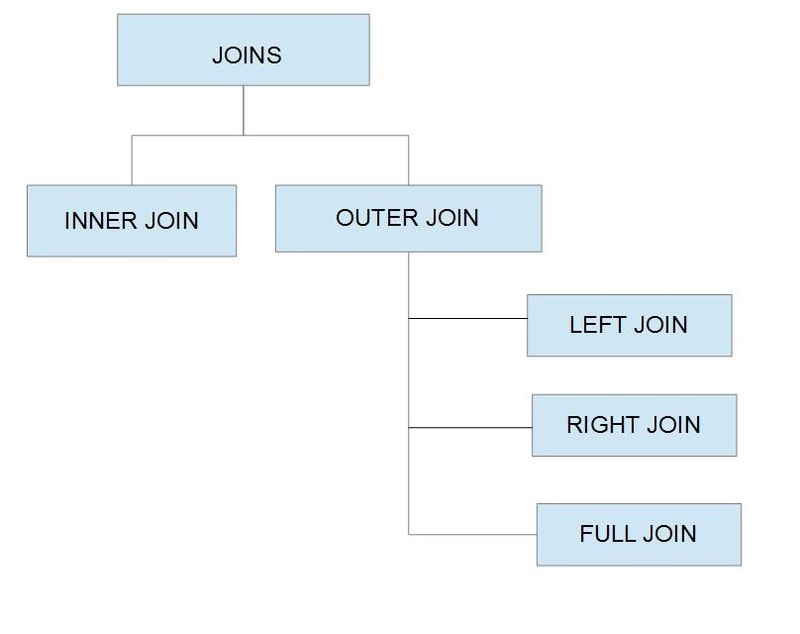 Inner join is like an intersection operation, whereas outer join is like an union operation. 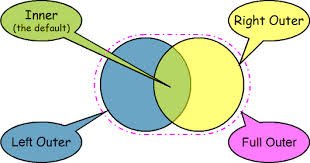 Inner join is two types, whereas outer join are three types. Inner join is slower, whereas outer join is faster than inner join. left join on (aka left outer join on) returns inner join on rows union all unmatched left table rows extended by nulls. right join (on aka right outer join on) returns inner join on rows union all unmatched right table rows extended by nulls. full join on (aka full outer join on) returns inner join on rowsunion all unmatched left table rows extended by nulls union all unmatched right table rows extended by nulls. So don't outer join until you know what underlying inner join is involved. Find out what rows inner join returns. Read my comments there re the many confused & poor answers. Then read my comments here re the many confused & poor answers. Mostly written as just JOIN in sql queries. It returns only the matching records between the tables. As you see above, Jose is not printed from EMP in the output as it's dept_id 6 does not find a match in the Department table. Similarly, HR and R&D rows are not printed from Department table as they didn't find a match in the Emp table. So, INNER JOIN or just JOIN, returns only matching rows. This returns all records from the LEFT table and only matching records from the RIGHT table. So, if you observe the above output, all records from the LEFT table(Emp) are printed with just matching records from RIGHT table. HR and R&D rows are not printed from Department table as they didn't find a match in the Emp table on dept_id. So, LEFT JOIN returns ALL rows from Left table and only matching rows from RIGHT table. Can also check DEMO here. Not the answer you're looking for? Browse other questions tagged sql database join inner-join outer-join or ask your own question. 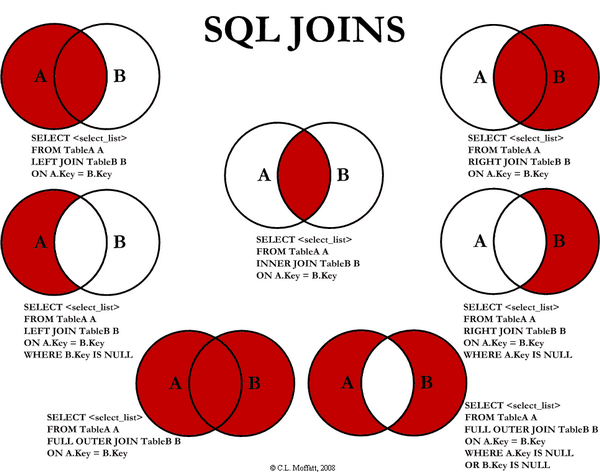 SQL join and left outer join: why are the results different? what is the basic difference between INNER JOIN and LEFT JOIN? SQL Server JOINS: Are 'JOIN' Statements 'LEFT OUTER' Associated by Default in SQL Server?